Step into an alternate dimension where familiar and horrifying scenes from the series await — from the menacing Hawkins National Laboratory to the Byers home. 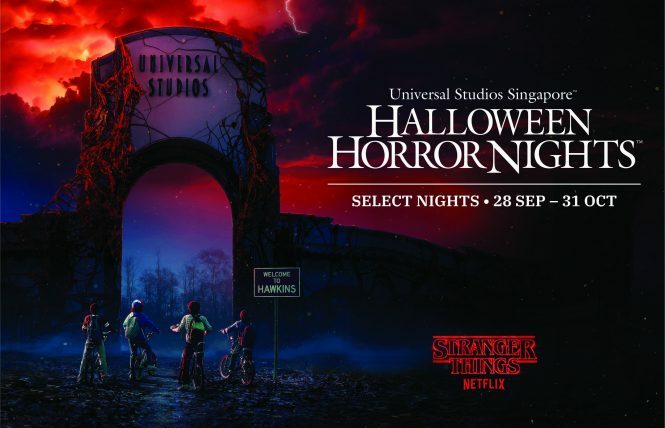 This Halloween, fans of Netflix mega-hit Stranger Things will be able to experience the series’ best moments and worst nightmares at Universal Studios Singapore’s annual Halloween Horror Nights event, which starts from September 28. Watch as the cheery theme park gets transformed into the Upside Down — a parallel universe which terrorizes the small town of Hawkins, Indiana, as depicted in the series. The blockbuster sci-fi thriller will be brought to life via a maze of familiar and horrifying locales such as the Hawkins National Laboratory, the Byers home with the colorful Christmas lights, and not forgetting, the Upside Down woods where the unknown lurks. Park-goers will also encounter iconic characters like Eleven, Chief Hopper, and plenty more as they navigate unexpected twists and turns. Apart from the Stranger Things maze, visitors can also expect the return of last year’s hugely popular Zombie Laser Tag, as well as Asian-themed haunted houses. Limited-time special tickets from US$38 (S$50) each are now available for purchase and comes with exclusive Stranger Things merchandise — Eggos and ’80s music not included.